Abu Dhabi carrier Etihad Airways will begin daily A380 services to the Australian city of Melbourne from June 1, 2016, the airline announced on Monday. The jumbo jet will operate flights EY460/461, one of the airline’s twice daily Abu Dhabi-Melbourne services. It will replace one of the Boeing 777-300ER aircraft currently deployed on the route. The new A380 service will increase the total number of two-way seats on the route by 26 per cent to more than 11,500 seats per week. Etihad Airways’ president and chief executive officer James Hogan said: “Melbourne is an important point on our global network, and our Abu Dhabi to Melbourne services continue to generate very high seat load factors on a year round basis. The double daily service will also provide travellers from Melbourne access to more than 900 weekly connections in 50 markets across the Gulf region, the Middle East, Africa and Europe. “What’s more, the A380 service from Melbourne will connect in Abu Dhabi to the A380 to London, offering our London-bound guests the convenience and class-leading comfort of an all-A380 service all the way,” added Hogan. Etihad began services to Melbourne on March 29, 2009 and added a second daily service to the route on August 1, 2015. It is currently the only airline offering double daily non-stop services between Melbourne and the United Arab Emirates. Within Australia and to New Zealand, Etihad codeshares on Virgin Australia and Air New Zealand flights from Melbourne to 20 destinations including Adelaide, Auckland and Sydney. Etihad received delivery of its first A380 from Airbus late last year and introduced the jet to London Heathrow from December 2014. Currently, two of the airline’s three daily flights to London are operated by the A380. In June, the airline began operating the A380 on one of its daily services to Sydney and also plans to deploy the wide-body jet on daily services to New York from December 1, 2015. 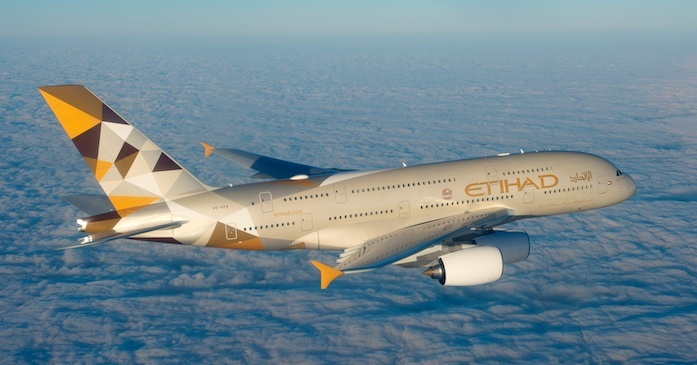 Etihad’s A380s can carry 496 passengers in a four-class configuration – The Residence, first apartments, business studios and economy smart seats. The Residence by Etihad is an ultra-luxurious three-room suite that includes a living room, separate bedroom and ensuite bathroom. Guests using the service will also be offered a VIP travel concierge service including a luxury chauffeur, private check-in and lounge, an Etihad Butler on board and an inflight chef.